inscription: Printed to the bottom left of the image: "The Yes Machine 30" x 40" Oil". "$2-" handwritten in pencil on verso top center. 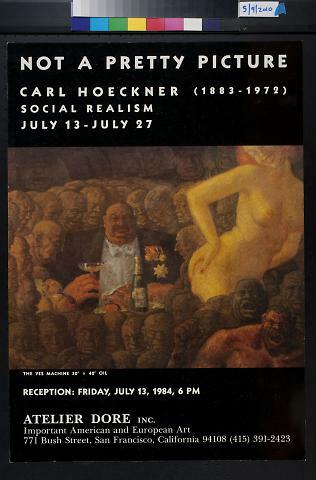 Poster has black edges at the top and bottom with a central stylized image of a man sitting at a table with champagne and a roasted pig looking at a naked woman flaunting her behind. The man is surrounded by other tormented looking figures colored a muted beige, a sharp contract to the black and white clothing of the man and the vibrant, glowing beige skin of the naked woman. At the top of the poster is ''Not A Pretty Picture / Carl Hoeckner (1883-1972) / Social Realism / July 13-July 27" in white. At the bottom is "Reception: Friday, July 13, 1984, 6 pm / Atelier Dore Inc. / important American and European art / 771 Bush Street, San Francisco, California 94108 (415) 391-2423" also in white.